Elise made some kind of dry oatmeal mixture last week and told me how to cook it. I totally didn’t pay attention, and decided I wanted to try that oatmeal this morning. It has oatmeal in it, and then some other kinds of nuts and grains. I did the 2:1 oatmeal to water ratio and nuked it for a minute like I usually do for regular oatmeal, but it didn’t cook and thicken up like regular instant oatmeal, so I had a kind of nutty oat soup for breakfast with an orange. For lunch a few of us went to Whole Foods. I really wasn’t in the mood for a burger, but decided to get a plant-based burger because, well, I’m on a plant-based diet. I got the Beyond Burger with vegan mayo and mustard. It came with lettuce, pickles and tomatoes. I also ordered a side of sunflower oil tater tots. The Beyond Meat patties are really good (I’ve made them before for the family when we weren’t on a plant-based diet), and it’s just as filling as a burger. Like I said, I wasn’t really that hungry to warrant a burger, so I’m still stuffed from lunch. 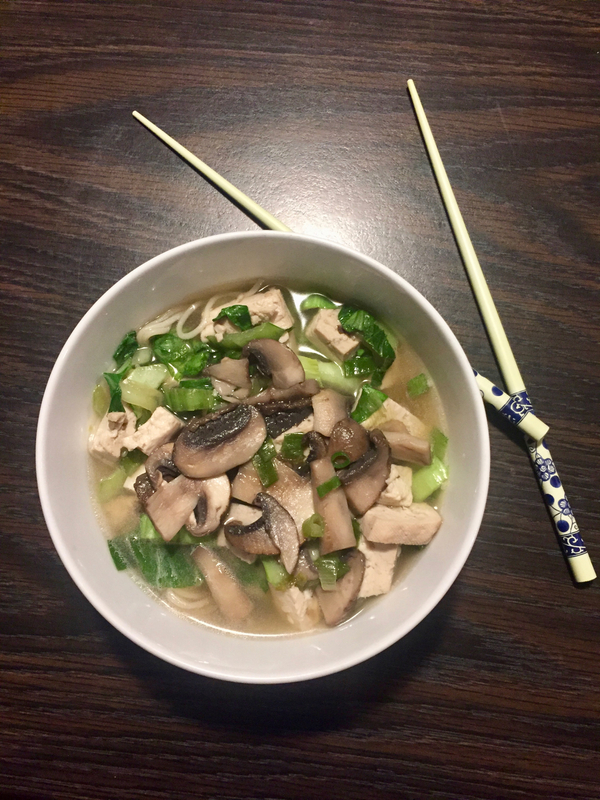 For dinner tonight we had millet and brown rice ramen with miso broth, mushrooms, bok choy and tofu. I love ramen, tofu, mushrooms and bok choy. Again, I think the recipes from the book “The Plant-Based Solution” are bland, so by adding a few squirts of liquid aminos, sriracha and some crushed red pepper the ramen turned out our really, really good. Stella has gone pescatarian and I definitely can sympathize with the issue of blandness. We eat a lot of bowls (rice bowls, roasted potato bowls, noodle bowls) filled with pickles and veggies. If you’re cool with eggs, this is a fantastic recipe that really got me thinking about how to get flavor in vegetarian food.